Two active giveaway Steganos Password Manager 19 license key. Download one unique copy of genuine license key to activate full features. Per serial license key of Steganos Password Manager normally priced at $24.95. In collaboration with Chips.de, Steganos offer unlimited genuine activation code. Get the serial key Steganos Password Manager 19 on this giveaway by registering your email. Steganos Password Manager is an easy to use account manager that functioned like Sticky Password Manager. It offer one place solution to manage important accounts. You can also sync your all account saved on the Steganos Password Manager with your iOS or Android devices. On the promo, the software is available for free. As mentioned above, there two active giveaway for the software. Use one of the giveaway link to download the installer with free activation code. 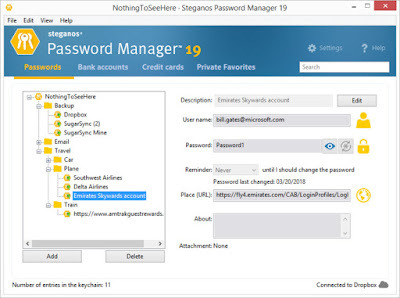 Giveaway link Steganos Password Manager 19: Visit the link! All giveaway page is in German language. Use google translate to convert it to English. Interested to download this software for free, open one of the giveaway page above. Enter your valid email, uncheck the option that says “I would like to recieve the Steganos Newsletter in the future (optional). Then click on the “Request Serialnumber” button to submit. The license key of Steganos Password Manager 19 will be in your email after submit. Download the installer and use the activation code on installation process. Steganos Password Manager can manage unlimited number of accounts. The software also features with password generator to create strong password and virtual keyboard.